Positive rallies across all equity markets have given the Euro a much needed boost versus the US dollar as in overnight trading the rate pushed through the 1.2900 level and closed above all three moving averages. Following the long period of consolidation and the falling wedge pattern subsequently formed, it is too early to say whether this rally is likely to be sustained for any period. Only a break above 1.33 could be taken as confirmation signal that the long downward trend has finally been reversed. Of greater importance to the euro vs dollar pair is the extent to which it has fallen out of correlation with the dollar swiss. Just to remind you until recently the euro dollar correlated inversely to the dollar swiss by anything between -0.8 and -0.9 and could generally be relied upon to provide hedging opportunities with this and other currency pairs. Yesterday’s announcement by the Swiss National Bank to weaken the franc by cutting bank cut interest rates and signaling that it would buy foreign currencies meant that the dollar swiss did not fall as the euro dollar rose. This move by the Swiss has also raised concerns that other central banks may soon be forced to take similar steps and intervene in the forex market. 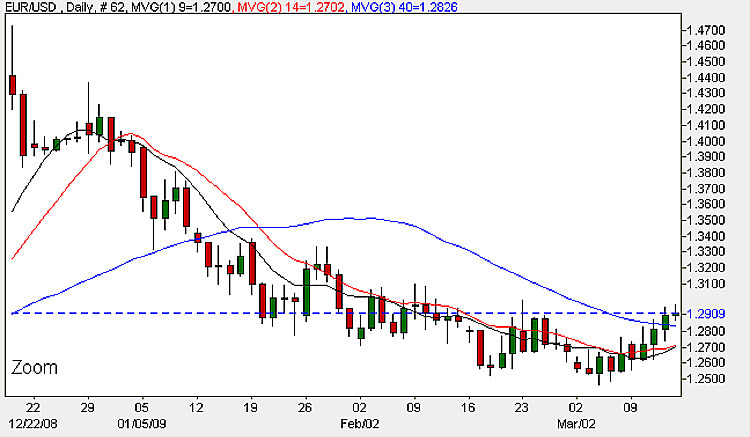 Possible trades today: buy anywhere below 1.2893 with a stop loss below 1.2709 – avoiding round numbers. Add to any longs if the price breaks above the 1.3000 level.